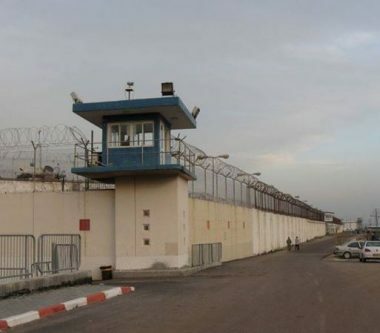 The Palestinian Detainees’ Committee reported, Sunday, that a number of detainees at Asqalan Israeli prison are facing seriously deteriorating health conditions and are being denied basic medical treatment. Karim Ajwa, a lawyer with the Committee, stated that detainee Ali Barghouthi, 45, from Aboud village west of the central West Bank city of Ramallah, is suffering from severe chest pain, arrhythmia and frequent loss of consciousness. He added that Barghouthi, who was taken prisoner thirteen years ago, and was sentenced to a life term and forty years imprisonment, is not receiving of his medications, and is not even sent for medical checkups. The lawyer also said that detainee Riyad Al-‘Amour, 45, from Bethlehem, who is serving a life term, is one of the most difficult medical cases, as he suffers from various health conditions, including cardiomyopathy, arrhythmia, in addition to suffering complications from gunshot wounds to his back, and underwent several surgeries to remove part of his intestine, and part of his liver, and replaced his duodenal valve. He also had open heart surgery two years ago, and requires professional checkups and follow-up. Furthermore, detainee Amir Abu Raddaha, from the al-Am’ari refugee camp, east of the central West Bank city of Ramallah, is facing several problems with his legs, especially the knees, and he requires treatment by a specialized orthopedist, which the Israeli prison authorities refuse to provide.